Such is the state of motorhome pricing, it’s all too easy to get tempted into parting with way more money than you initially expected. 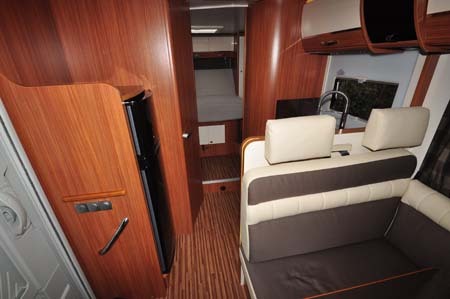 Adria is no exception, sticking an enticing £68,390 in the window of this island bed A-class Sonic Plus. But, there’s more to it than that. First, it’s barely equipped until you specify the All Inclusive Pack of options, adding some £4,000 extra in the process. Just as significantly, it puts some 128kg on the MRO (mass in running order, ie kerbside weight) – hence the need to consider upgrading the overall vehicle weight limits. As here, it’s bolstered by the heavier-duty 4,300kg chassis with 180bhp three-litre engine, but that adds the best part of £5,000 to the bottom line. 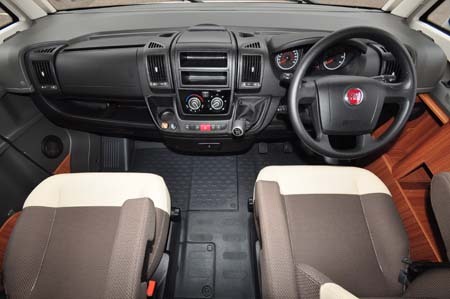 After that, the main consideration will be whether to go for Comfort-matic semi-automatic transmission, at £1,920, with reversing cameras and solar panels the two most popular dealer-fit extras. To be honest, it’s the three-litre option that feels most at home in a vehicle like this – offering a more refined overall performance but also plenty of torque for those moments you want the pulling power of a small train. 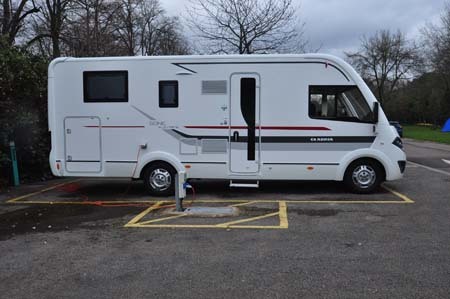 It’s easy to drive, too, once you’re over the fact that dimensions – including width – are almost the same as a typical coachbuilt motorhome on a chassis-cab. It’s just that an A-class like this gives you so much more interior space – as well as a king/queen of the road feel when you’re on the move! 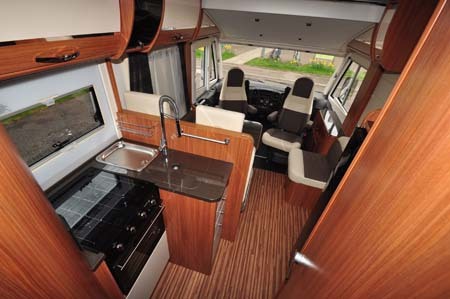 The I 700 SC’s layout gives you a true four-berth, with a separate bedroom at the back based around an island bed, on top of the usual drop-down double over the cab area. 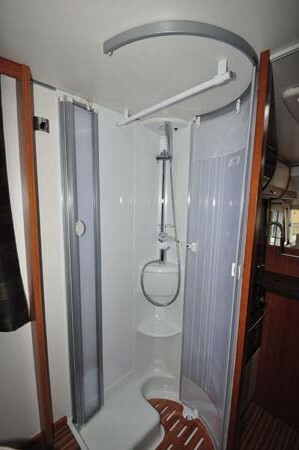 Adria also splits the washroom facilities, offering a decent-sized toilet room on the offside and a separate shower cubicle opening directly into the bedroom area. Ah, that bed. Flanked by his and hers wardrobes (one’s just a bit larger than the other), and with windows to either side and a Heki rooflight overhead, this doesn’t just offer comfort supreme. It also has an electrically adjustable backrest that makes reclining (for reading, for example) a real joy. 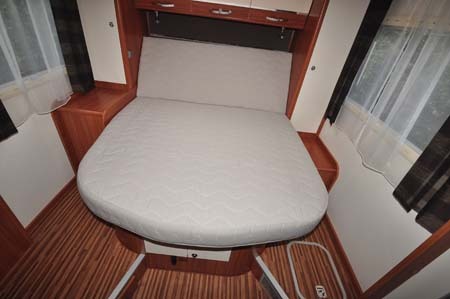 The bed at the front also has an electrical operation, gliding effortlessly into place with both cab seats’ backrests easy to fold over should you want it at its lowest setting. It’s a continental lounge, but there’s certainly plenty of space for sprawling here, thanks to an L-shaped for the main settee/rear travel seat, a small inward-facing seat and, of course, plenty of space around the swivelled cab seats. The easy adjustment for the table here helps, too, in allowing plenty of space for getting past. If there’s compromise anywhere, it’s with kitchen space. True, it’s L-shaped here, and there is a separate drainer to the sink (not also that swish mixer tap) and a Thetford triplex cooker. Worktop space is limited, although storage is good. The fridge-freezer across the galley is a generous 150-litre model. Rather than box in the space above, Adria has left it as an open ledge (although it’s the ideal spot should you wish to add a microwave and/or a bracket for a flatscreen TV. 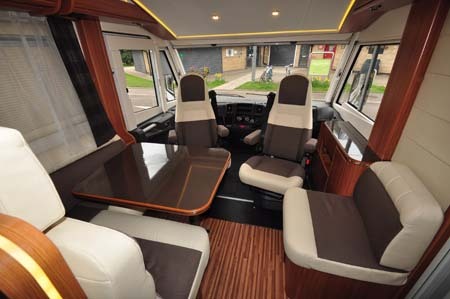 Interior lighting – all-LED and a good mix of ambient and direct – borders on the extravagant, but quality touches extend to double locks for the cab and caravan doors, superior insulation levels, all-GRP bodywork with aluminium sideskirts, Polyvision windows etc. Is it worth £77,000-plus? If you want the best and aren’t interested in getting involved in any badge snobbery, this is up there at the top of the A-class. 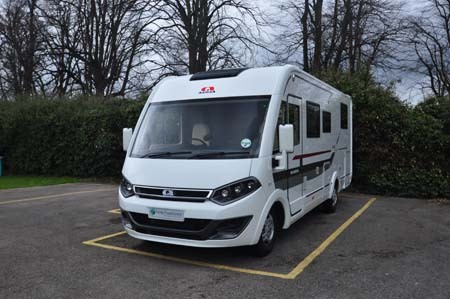 There’s more information on the Sonic I 700 SC on the Adria website and to find out more about our low-cost premiums visit the motorhome insurance discounts page. 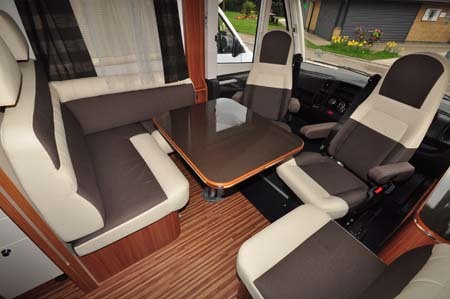 Great looking motorhome but a bit to long, mine is 6 meters but an 18 years old Autosleeper “Amethst” and they are still making the lay out ont there new model.